Home > Blogs > What is involved with Tattoo Removal After care? What is involved with Tattoo Removal After care? Tattoo Removal After care: What’s Involved? Wondering what tattoo removal involves? Don’t know what to expect? In most cases they are little or no after side effects from tattoo removal. We start most treatments with conservative settings, because every ones skin is different. After a tattoo removal laser session, your body may need time to recover and rebuild healthy skin. That is why it is highly recommended that customers avoid any vigorous activity for up to a few days. Of course, smaller tattoos require less down time. However, in general, it is necessary that all affected areas go through a healing process to keep your skin protected and healing properly. An antibiotic dressing will need to be applied daily until the area heals. Furthermore, your body is a given resting period for a minimum of 5 to 9 weeks between each treatment session. This allows the body enough time to absorb and remove the tattoo pigment particles through its natural defence mechanisms and lymphatic system. You may experience certain side effects from tattoo removal, most customers don’t. Customers may experience scabs or blisters forming on the top layer of the skin, within or around the tattoo. This looks like a bubble but it is important that you don’t burst your blisters as it can result in an infection. Blisters are in fact your body’s way of protecting your skin from bacteria. The blistering can last around 3-5 days, but if it there is severe discomfort its best to contact your doctor and let us know. Swelling is another potential side effect and there are a few things you can do to reduce the swelling. You can apply ice to the area for around 10 minutes at a time, with 5 minutes break in between. To help with the inflammation for larger tattoos on the torso, back and chest it is also best to avoid strenuous repetitive movements. If you’re experiencing swelling on your arms and legs, keep them elevated to help with blood circulation. Larger tattoos can take up to 3 to 5 days before swelling dies down. Experiencing redness directly after a laser tattoo removal session is normal as your skin is still very sensitive. It is caused by pinpoint bleeding within the skin and can last up to 72 hours. If you start to see excessive amounts of blood, however, it is best to see a doctor and let us know. Avoid exercise and keep the skin under your dressing dry by patting off any sweat or water. If you’re redness does not seem to be getting better within 7 to 10 days, see your doctor and contact us to let us know. Itchiness can happen a few hours after a laser tattoo removal treatment. It is normal for itchiness can last up to 6 weeks. It’s best not to scratch the affected area. However, if the itchiness becomes severe, see your doctor and let our clinic know. Once the blisters have subsided, it is common to see crusting, dryness or scabbing start to form. Don’t pick at it. It’s best to leave your skin to heal on its own to avoid irritating it further. Do you suspect an infection forming? Please seek medical assistance right away. Infections are characterised by increasing redness and pain. You may even start to notice a discharge of pus coming from a deep lesion within the skin. 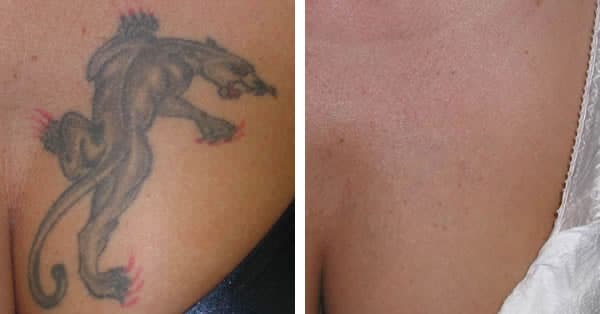 It is crucial that customers are consistently following through their laser tattoo removal post treatment routine. This is crucial if you want to make your following treatments safe and to overall achieve a successful tattoo removal outcome. For the affected area to heal properly follow the advice of our clinicians and your GP and apply dressing daily. To begin your laser tattoo removal contact us today! Talk to us today! At Xara Skin Care Clinic we use the most advanced laser technology available to remove or fade your unwanted tattoos safely painlessly effectively removed. Our highly trained technicians will carefully assess each patient’s individual needs to develop a personalised plan that is best for you. Located on the North Shore of Sydney, Xara Skin Care Clinic strives to achieve the fastest and most effective results to reach your full satisfaction! For more information please call us at 02 9420 977 or 04325 90992. Most customers don’t actually develop laser tattoo removal scarring. But in case this does happen or you notice a minor textural change to your skin, Xara Skin Care Clinic can remove scars with Thermagie-CPT and other scar removal treatment. To find out more please call 02 9420 977 or 04325 90992. How long will it take to remove my tattoo with laser removal? The speed of laser tattoo removal depends on several factors. This includes the kind of colour and type of tattoo ink that was used and how deep the tattoo ink reaches into your skin. Furthermore, each treatment can be 5 to 9 weeks apart to allow the skin enough time to heal between. To find out more please call us at Xara Skin Care Clinic 02 9420 977 or 04325 90992. Does tattoo removal laser hurt? Laser tattoo removal is relatively painless! Customers will only feel a type of sensation akin to a soft rubber band flick to the skin over. The treatment takes between 15 to 30m minutes depending on the size of the tattoo. And the good news is, getting laser tattoo removal is much less painless than getting a tattoo in the first place! To find out more please call us at Xara Skin Care Clinic 02 9420 977 or 04325 90992. Our highly trained technicians will conduct the laser tattoo removal treatment using a highly precise microsurgery technique called “selective photo thermolysis”. This technique uses wavelengths of light at very high energy levels at an extremely short period of time to heat the specific tattoo pigmented tissue and shatters them into smaller ink particles. This gradually destroys them whilst the body’s immune system will work over several weeks to flush the ink out of your body. It is painless with the whole laser tattoo removal treatment is usually only lasting a few minutes. To find out more please call us at Xara Skin Care Clinic 02 9420 977 or 04325 90992. Xara Skin Care Clinic is on the North Shore of Sydney. We specialise in providing the best skin services tailored to suit your specific skin type and skin problems. For more information please call us at 02 9420 977 or 04325 90992. This is an excellent post. This website has lots of useful things, it helped me in many ways.